PRIMUS - Rigid mobile screening machine with performance features of a professional machine and throughput of up to 70 m�/h. MUSTANG - Currently most powerful mobile screening machine - designed as tandem center-axle trailer. Throughput up to 160 m� due to 30 m� of effective screening surface. JUMBO - Only mobile trommel screen machine with two trommel screens, which rotate in opposite directions, for screening of 3 fractions - allows for throughput of up to 160 m�/h. MAGNUM - Currently the largest European-built screening machine with throughput capacity of up to 200 m�/h with 48 m2 of effective screening surface. TOPTURN 300 - Trailer-operated compost turning machine with professional technology. TOPTURN 4000 - High-capacity turning machine for high throughput capacity and minimum space requirements. TOPTURN X - Fast moving and traction on the most difficult surfaces (snow chains installation possible!) with the wheel undercarriage or impressive maneuverability and grip in all situations with the track self-laying track undercarriage. SIDETURN - Currently most powerful turning machine for trapezoid windrows - handles a take-off width of 2 m and a windrow height of 3.5m. MASHMASTER - Universal mixer-crusher for the processing of biogenous material to achieve an optimum starting mixture for the biodegradation process. MASHSEPARATOR - Homogenization of wet bio-waste, food scraps, commercial kitchen waste etc. in robust hopper utilising 2-4 augers. Material discharge by auger press with separation into a solid and liquid fraction. High throughput capacity of up to 24 t/h due to use of duplex augers. BSFC - Process technique for the treatment of wet biowaste. 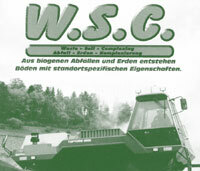 W.S.C - W.S.C. process allows the redevelopment of surface constructions and landfills! SPLITTING PLANT - split soiled biogenious waste, wet or dry, into a cleaned fraction for composting or fermentation and into a plastics fraction for incineration. Separation of residual waste, bulky waste, industrial waste etc. into a light fraction with high calorific value for energy reclamation and into a heavy fraction with high organic contents for biological treatment.